I’m still keeping it real here. Remember my behind the scenes photo from last week, click here if you missed it. More reality is coming your way today. Brace yourself. No, seriously, I mean it. You are not going to believe this. First off I am talking about my daughter’s room, and yes I have her permission to talk about it. My daughter is all about music, and interior design is not really her thing. She’s in college, so I try to not tell her how to take care of her room. But… well… things had gotten a little out of hand. I offered to help her to get it organized and she said yes! I know it felt like an overwhelming task to her, but I knew we could do it. Deep down I’m Monica from Friends. I like it neat and clean. Let me say at the end of the day, we had 4 bags of trash from here and about 8 bags of clothes and shoes that we donated to another family. Here’s what came out of the room. Here’s how we approached the room. We pulled everything out of the closet first. That is the main storage for her room, so that is where we were going to be putting things up. So we needed to clear out the stuff we were not going to keep first. We made three piles – KEEP, GIVE AWAY, and TOSS. 2. As we put the KEEP things back in the closet, we organized by t-shirts, long sleeve shirts, short sleeve shirts, and dresses. I also organized a bit by color. We refolded things and put as much as we could on hangers. Shoes went in the cubbies. 3. We picked up things off the floor and put them on the bed as a staging area. Here she decided what to keep or get rid of. We did one side of the room first so we could feel the sense of accomplishment before we went to the other side. 4. Books, clothes, shoes, games, purses, tote bags and such went in the closet. The dresser holds underwear, pants, shorts, and night wear. I think the big thing we did was to clear out clothes and shoes she no longer wore and get rid of old notebooks and papers from school. Once we got rid of the old clothes, then there was room to put up all of the clothes she was keeping. I think too, the other issue was she did not have a place for everything. There is now a place for everything, so hopefully things don’t get out of control again. 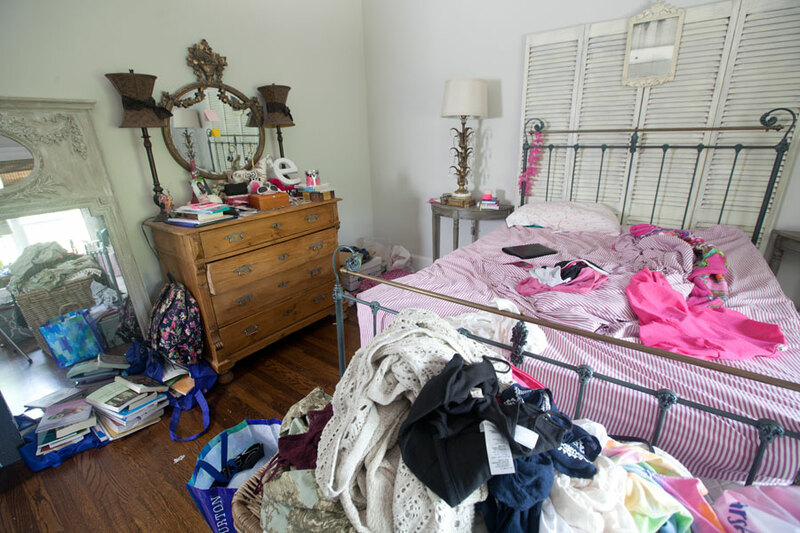 She had a lot of stuff in her room, but she is not a hoarder. I think she just didn’t know what to do or where to start. Once that feeling of helplessness sets in, then people feel like they just can’t do it. We talked about keeping things put up every day. In the past when I’ve taken photos of her room, I’ve staged it for the blog. This time I left it like she uses it. I removed a few things for the photos, but only a few small things. I think she did a fabulous job, and am proud of her for sticking with it all day. I know organization isn’t everyone’s thing, but I think we all can learn to do it. This was not just a case of shoving things in the closet and under the bed. The closet is not neat and organized. A ton of things were removed. We still have so more cleaning to do in here, but this clean out took about 5 hours with 2 of us working, although I did take a break at one point. Evie is so happy with how lovely her room looks now. Her closet also looks so pretty. We celebrated the new clean room by eating pizza and binge watching Friends. Funny story about the big gray mirror. I bought it for a customer. I had it all set up to have it delivered. Then FedEx informed me the box was 2 inches over their max. Yup, so guess who got the mirror? It’s really pretty in person. That’s not dust on it. Oh wait, it is. Neat little tip for you, if you want to look skinnier in your mirror, simply lean one against the wall, where the top of the mirror is closer to the wall than the bottom of the mirror. Seriously, try it. You WILL look skinnier. See? Not just anyone would have told you that? I’m not sure I’ve shown you the detail on the euro pillow covers before. They are vintage and have these beautiful initials on them. My daughter is EJ not EL, but close enough! I love the cut work too. 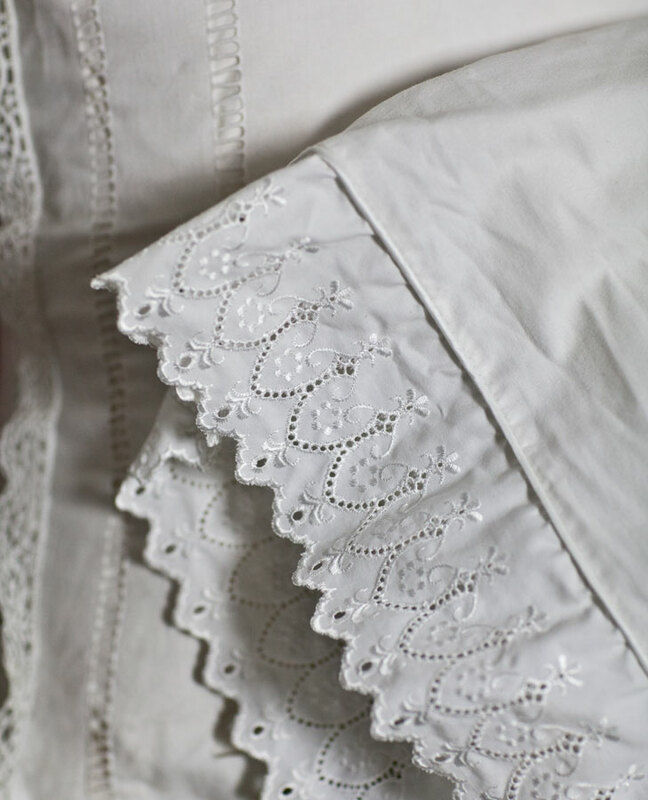 I even used pretty eyelet trimmed pillows in here, although I never get to show them to you. It’s been week, and I asked Evie how things are going. She said one of the things she is doing differently is that now she hangs up her clothes immediately rather than leaving them lying about. Each night she checks her room before she goes to bed to see if anything needs to be put up. Then she puts up whatever needs to be put away. Put up things each day. I’m sure it wasn’t an easy task but it was worth all the effort because it looks great! You’re welcome to drop by and help me in our guest room any time, lol. Funny thing is I’ve been binge watching Friends with my daughters and I also have those pillowcases with the pretty lace edge. Great minds think alike! Oh that’s funny Angie. Have you watched Gilmore Girls? That was our first binge watched show. I wanted to know if you still love the agreeable grey and eider white for trim. I am getting ready for a redo in a house we bought in Vermont? (I removed your email so it wouldn’t show up on the blog. Thanks for keeping it real. It helps people like me! 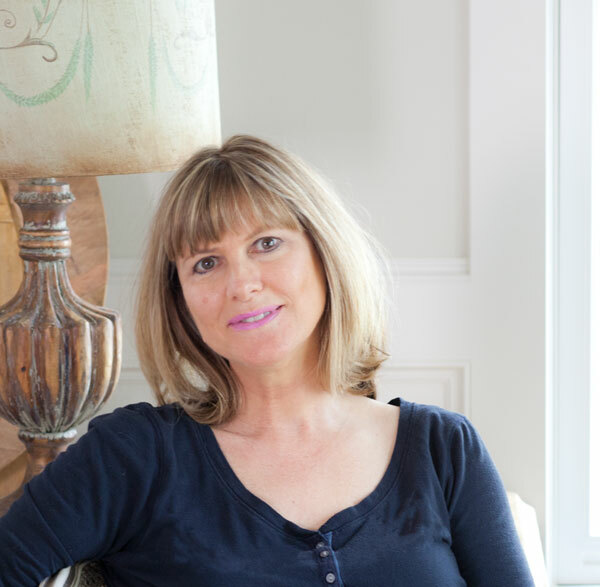 I have a three teenagers and I have been trying to keep a hands-off approach with their bedrooms – so they have their space. UGH! It is a constant struggle. Currently, I am working with my 16 year old to “makeover” her room. She is an artist and she has a ton of art supplies. She also prefers a much more “bohemian” decor vibe. I guess it’s all a part of motherhood.
? I can so relate. Mine is a boy, and a techie. So electronics all over the place. We get things sorted and before you know it…. we are right back where we started. Clothes and shoes maintain an order, it’s just the ‘stuff’ that drives me nuts!!!! In order to keep me sane, I am a neatnic, we have a charity truck come by every other month or so. They email me when they are going to be on my area and I schedule a pickup. Every season whatever wasn’t worn or not liked, goes in the garage on a box for the pickup. Next pick up on the 30th of this month and we have three boxes. ? Her room looks great. I bet she loves it more, now. Sometimes you just need a little help. Your post brought up four key points that resonated with me. 1. For some of us, once the mayhem has reached critical mass, we become paralyzed and can’t even begin to figure out where to start to begin to bring things into some semblance of order. 2. Some of us aren’t a solo act and need a partner to help us shake it up, shake it out and kick things to the curb. 3. A place MUST be created for ALL of the things. If things have no designated place, they eventually become clutter that sets out to conquer all available surfaces. 4. Create habits. Even if your inner 3 year old is screaming ” No! No! Don’t wanna!” and your inner teenager is sulking and muttering “I’m not gonna and you can’t make me!” create and implement habits that keep your space…..well, habitable. Number 4 has always been my downfall. I have a very vocal inner 3 year old and a very obstinate inner teenager that have conspired, for decades, to keep my inner adult from having a voice, lol! But I’m learning how to turn down the volume on my two inner brats and let the adult have her say lately. I’m 56 and I’m here to say that you can teach an old dog new tricks! My bed is made every morning after I have my coffee. A small load of laundry is washed and hung up to dry. Kitchen is cleaned after dinner and the coffee pot is set up for the next morning. The bathroom is cleaned every night after we bathe. Takes about 3 minutes. The dog is brushed and the plants are watered on alternate days. I put things away as soon as I’m done using them.. I declutter and/or clean an area every day. I put whatever is going to Goodwill in a bag and when I go outside I bring it and put it in the trunk of my car. I do my errands and grocery shopping one day a week and drop off the bags in my trunk at Goodwill that day. It’s amazing how much better my home looks and feels just implementing those habits! Keep showing non-staged areas of your home. 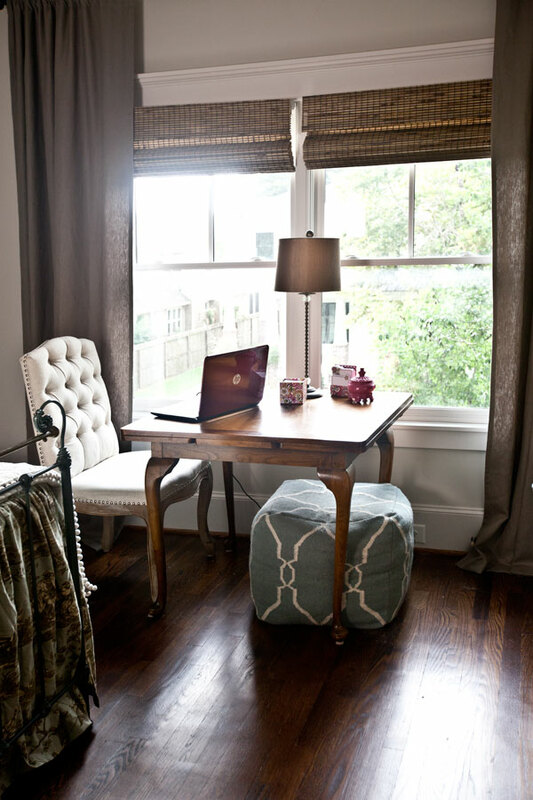 There are too many sites and blogs that show only the perfectly staged home. That’s not reality. And it leads too many people to believe that there’s no hope for them and that they’ll never measure up to an impossible standard. Showing the less than perfect areas in your home? Well, that’s a kindness you’re doing for the rest of us! Thank you. Very well thought out and excellent points. I should have gotten you to write the post. I love all you said. I too, love all you ennumerated…good points! 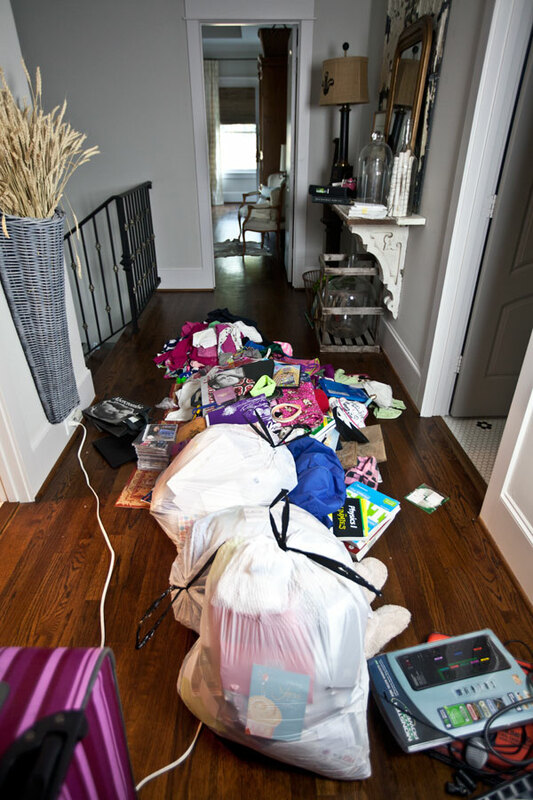 I do love seeing posts where the reality is shown…it’s so easy to get overwhelmed with the piles to be dealt with and dirt and dog hair, and see all these perfectly “staged” homes, and to forget that they ARE staged! One thing and one step at a time gets it all done! Thanks Joanne. Oh my, there was a lot of dog hair in there, because that is where our collie sleeps!!! I completely agree with all points. Anita is right when you cover excellent points. 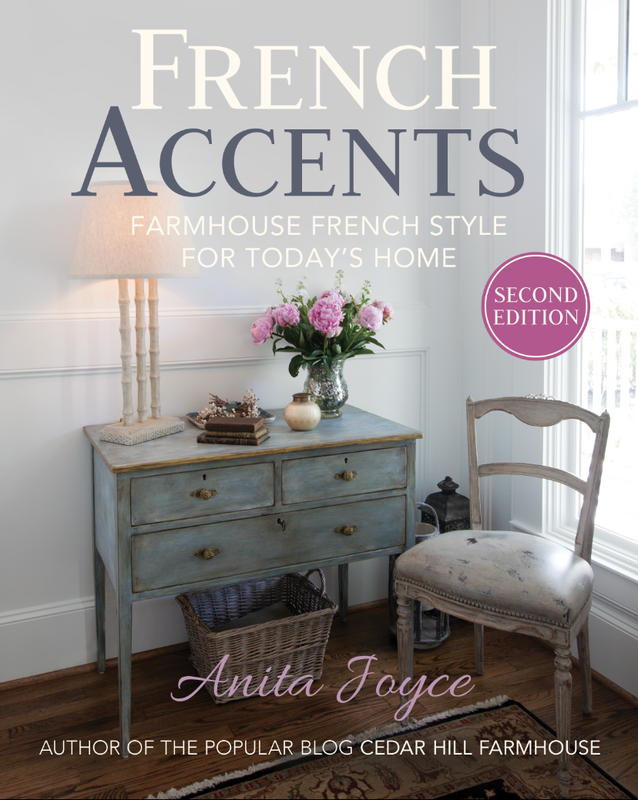 As always Anita we show appreciate you sharing helpful tips and covering most of everyone’s short comings to conquer! Thank you for “keeping it real”…..because that is real life! My daughters now have their own places….those lessons haven’t helped them yet….though to be fair…one has a toddler and one has a job she has to get to early. 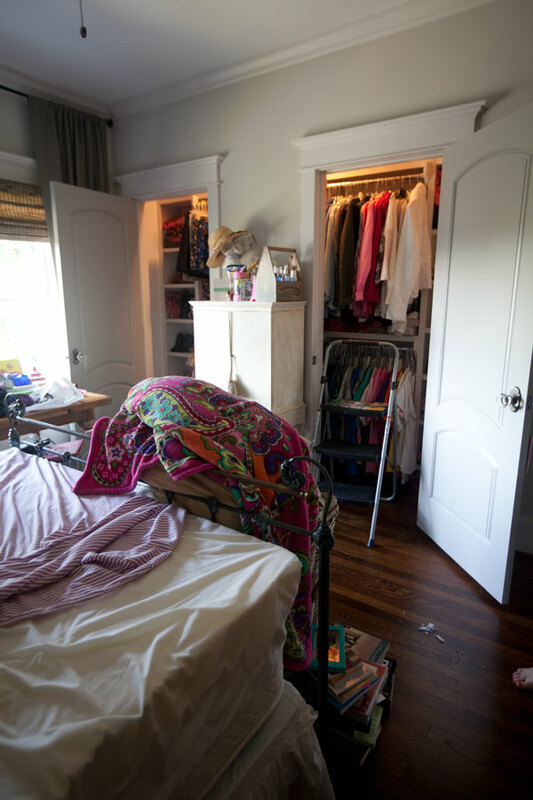 alas….I hope your daughter can maintain her room….it is gorgeous! So spacious. Ours are small….which means we need to stay on top of it even more….. Thank you for the input…. I am like you – hanging the clothes in the closet in order. I get teased by my husband that I alphabetize his clothes, but it makes it so much easier to find things. I know that the key to keeping it organized is putting it in place immediately and not leaving it to do later. My daughter is 32 and lives by the ‘do later’ method. It drives me crazy and every so often I go in to her place while taking care of my granddaughter, and I alphabetize it all. Then she calls to ask where something is. Thankfully we both laugh about it. I’m doing a big purge in both of my sons’ rooms right now so I know what they are going to need for back to school clothes. I’m loving the cleaned out and decluttered look so much in their rooms I’ve been packing up little boxes of “stuff” to donate when I haul their clothes away. The house can breathe. Her room looks lovely and that mirror is to die for. 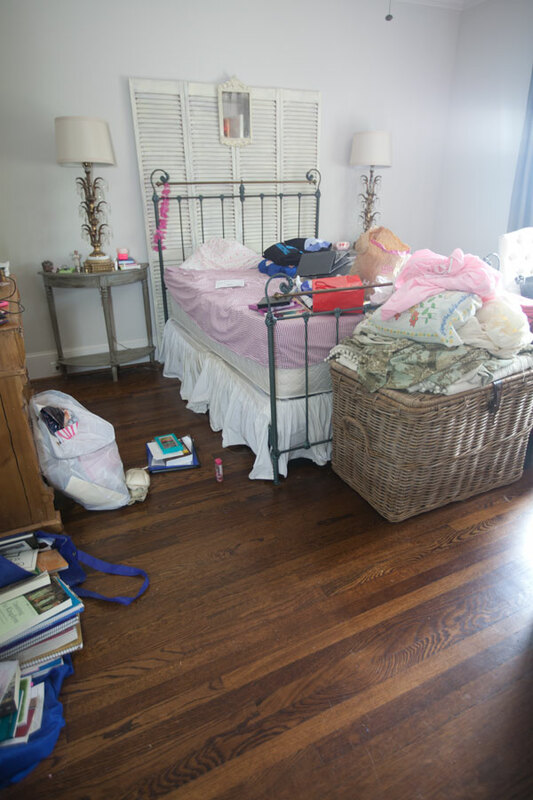 You are a great mom and through your support, Evie was able to start the process of de-cluttering her room with you by her side to guide her. You certainly set a great example for her. 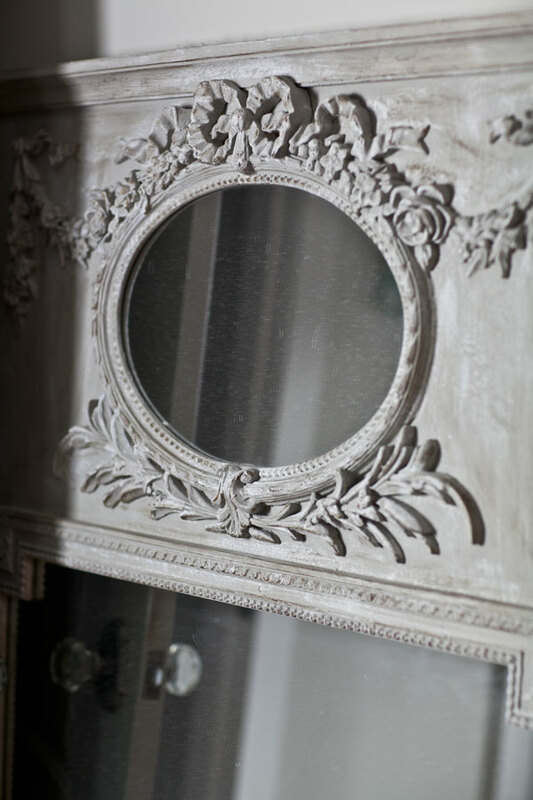 And, must say that the mirror is so beautiful…maybe it was fate that the mirror was too large, as it looks wonderful in Evie’s beautiful room. Oh, I am sending this link on to my granddaughter. Maybe before she returns to college we could work to finish up her room! That way when she returns home for the holidays, it will be a great retreat after a cramped dorm. Thanks Linda. We neatniks think the ‘less neat’ love clutter, but I don’t think they really do. They just don’t know how to deal with it. At least that’s the impression I get. Interesting Mo. Well I’m not sure where I got that. When I say we ‘put things up’ yes that means ‘putting things out of sight, where they belong.’ I thought that was not a regional thing. Well now I know. Regional differences in speech patterns are interesting, aren’t they? I’ve lived in the deep South all of my life. To “put up” is very common phrasing here. You’ll also hear someone tell you to “get down” as in “Why don’t y’all get down and come in the house?” if you’re in a vehicle. Where “put up” instead of “put away” came from, I’m not sure. But “get down” instead of “get out” of a vehicle stems from the days when transportation was a horse drawn carriage or wagon and you, literally, stepped down from the conveyance to exit it. Speaking of “put up” and “put away”, when I first came to south Louisiana (which is Cajun country), there were quite a few oddities in the speech patterns here that took some getting accoustomed to. I remember being asked one day if I had saved the dishes. I, in all innocence, asked “Saved them from what?” Then I was in trouble for sassing an elder. I had no clue that I was being asked if I had put the dishes away, lol! I like your daughters! Like Evie, I can be messy and like Elise, I’ve been known to run around the house in just a t-shirt. I personally enjoy decluttering. I’m just weird that way. Well, I can understand the clutter and needing to clean it up, but I miss the colors that she had in her room. It now looks like it belongs to a young woman, instead of a teenager in college, little too neat actually. But, that’s just my opinion. Glad you enjoyed your time doing it. Deborah, it’s her room not mine. She’s in charge there. She’s actually in her twenties, not a teenager, and I think her room is reflecting that more. She wanted it to look more grown up as she matures. But at the end of the day it’s what she wants, right? I support her in having the room reflect her style. Oh, Anita, you have perfect timing! I retired in June after 40+ years of teaching. So while my former classroom is (has been) consistently organized, many areas of my home have slipped down the slippery slope to total disarray! Your gift through sharing this post has inspired me to begin tackling my hidden spots. Please continue to share reminders, tips, and maybe even “assignments” during the coming weeks. Thanks for being a true friend! Go Karen!!! I hope you get it all organized. 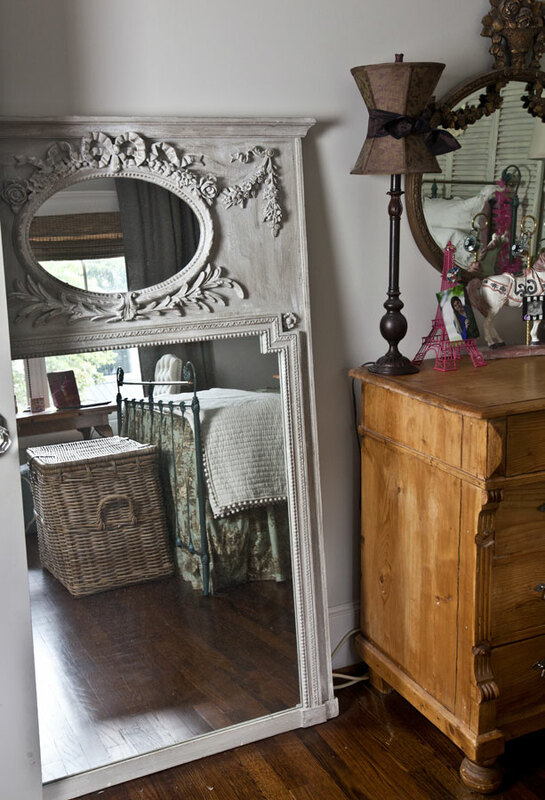 What a fabulous job of de cluttering, and I can’t help but say, your mirror is to die for!!!?? My clothes not the problem, it’s the sewing and craft supplies! They are in my gueguest room t which I’ve just emptied and painted. (Sherwin Williams Silvermist, gorgeous!!) I need to sort and away instead stuffing it all back in and it’s like asking me to give away favorite toys! I’m sure I’ll use it, whatever it might be… sometime! Oh I know Cheryl. As soon as you throw it out, you need it, right? It’s a tough call, but I know you’ll do what works for you. A family member once told me that people who keep things are creative — “I can use that.” That’s me. I often find an innovative way to use something I’ve kept. But the problem is that in the meantime the stuff piles up. So I’ve started trying to use some discernment. Yes, eventually I probably can find a use for nearly everything. But WILL I? I’ve gotten rid of a bit of clutter by saying, “No, probably not, or at least not soon enough to justify the anxiety all this clutter causes me.” While I accumulate things, I happen at the same time to love neatness, cleanliness, and order. So I keep working on it. 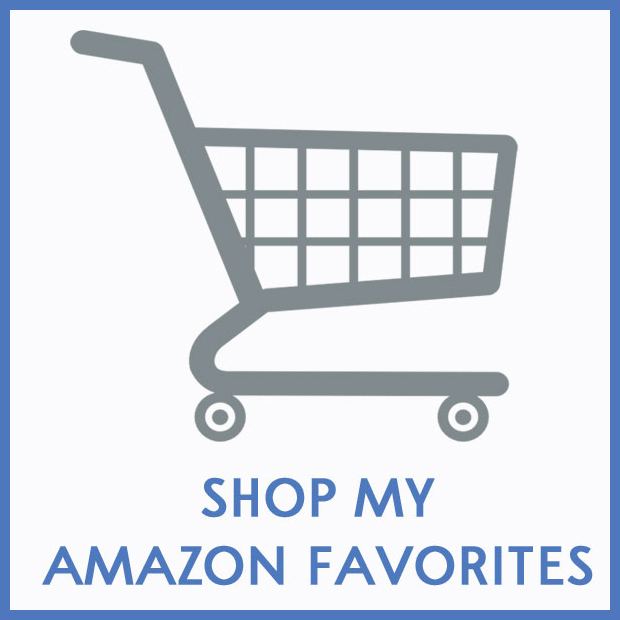 Really, really admire your taste and your wonderful website! And I am always noticing the lovely bed covers that you use. 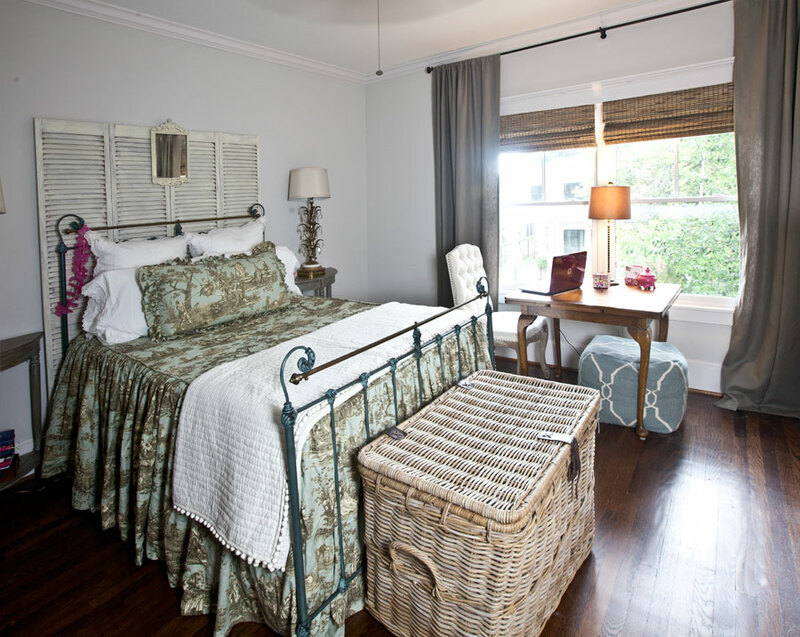 I love that it looks like the bed is wearing a gathered skirt! So could you share about them? Do you sew them? Are they from a custom tailoring shop? Or is there a retail outlet (that you would be willing to share) where I could purchase them? Thanks! I make them Linda, but I am trying to find some good quality bedspreads of similar design that I can recommend. I am getting close. Thanks Anita! I appreciate your quick response. I love the look; I am slowly getting things cleaned here. We are not hoarders but there are stacks of stuff, all over the place, in every room, unbelievable. 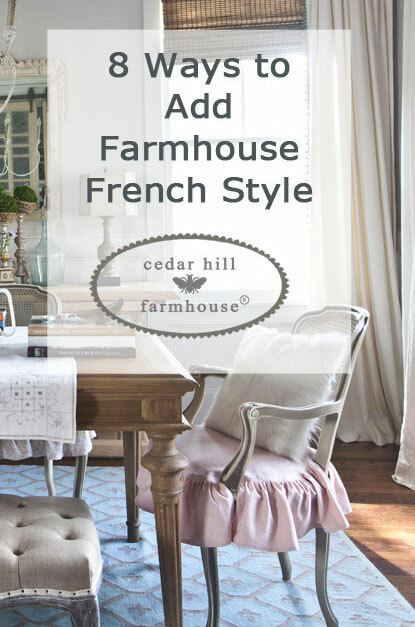 Love your French Country inspiration. Oh, and I love the bedspread. The long skirt is adorable. Thanks Roxann, good for you!! I am new to your blog, and maybe you have said before, and I missed it, but what it the name and brand of the paint color in her room? It’s just perfect! I have been searching for something like this! Thank you for your hints and examples and before and after. I like the honest straightforward approach you have! Hee hee Audra. You are so sweet and kind. My friend Peggy is always trying to help me out in a similar fashion. Hugs!! I have orders from my son to declutter and he is right. It’s time to get rid of all my dishes that I tablescape with. Your daughter has a beautiful room. Ha, ha Mary, errr I may be delayed a bit. Why don’t you start without me? Anita, what a nice job you and Evie did with her bedroom. You have decorated Evie’s room and it is just so beautiful! Love that grey mirror! It’s lovely! 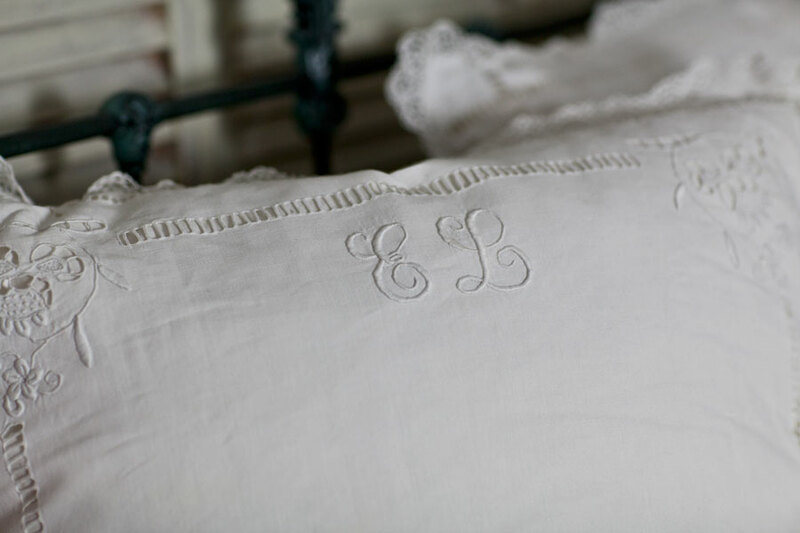 And the antique linens are so unique. 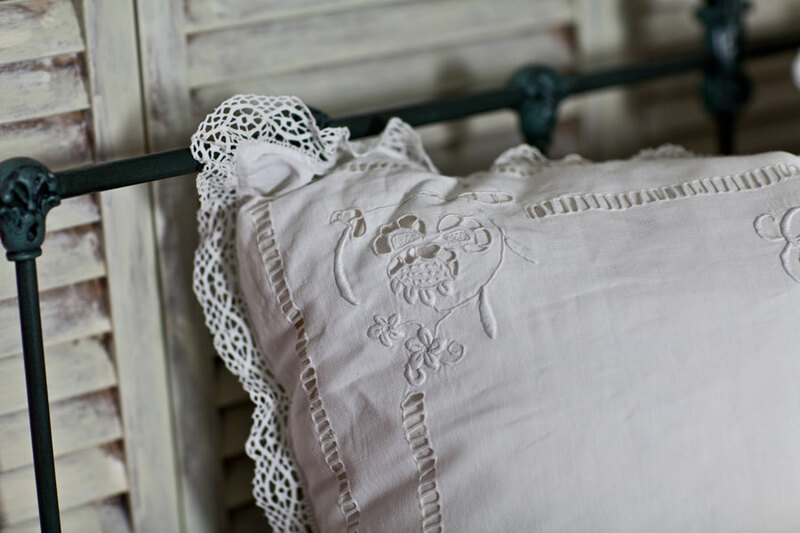 I have a lot of antique linen, dishes, etc. which my Grannie gave me and I really treasure them! I have so many precious memories each time I look at them. 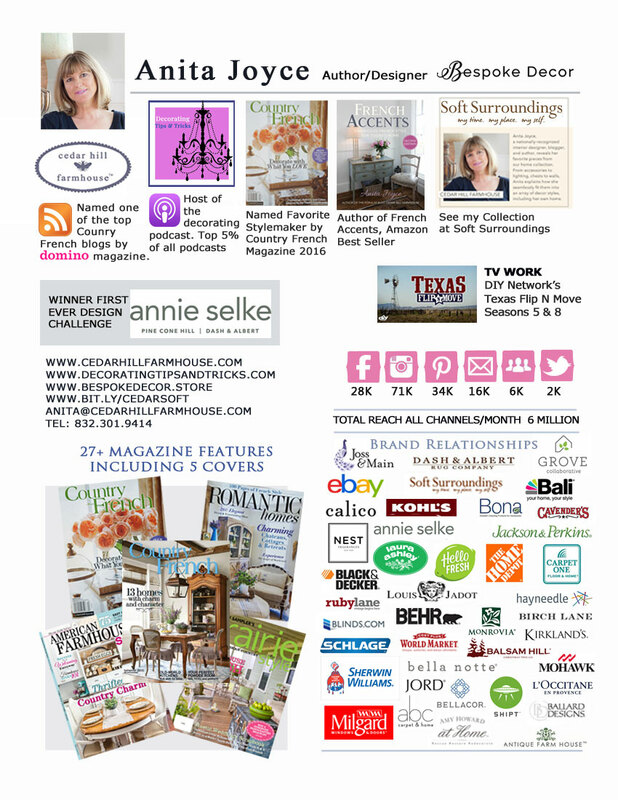 My husband and I love antiques and have been blessed to have them in our home! Each piece comes with a “treasured” story! I enjoy your posts! Hope you have a wonderful week! Thank you Mary Ann from Canada!!! So happy to hear you enjoy old things too. Thank you!!! 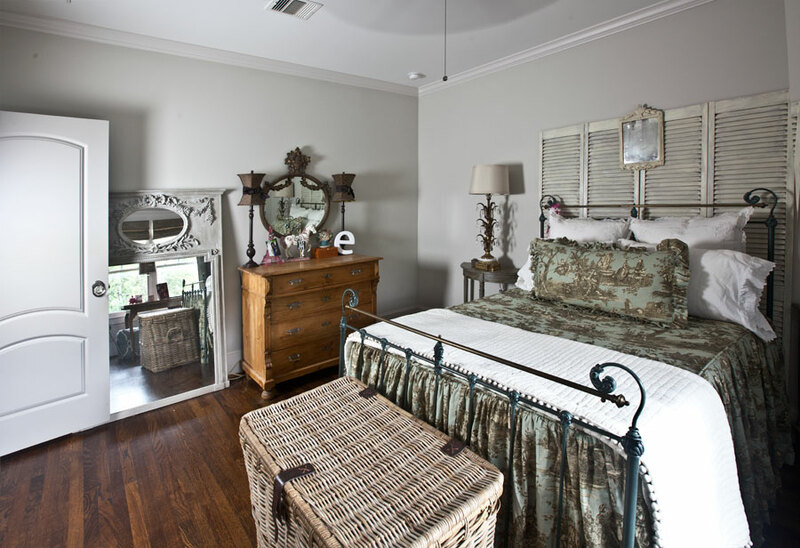 Hi Anita,….I would absolutely kill for that exquisite grey mirror in your daughters room! Can you tell us where you bought it, and if there is any chance of getting another one? Or was is a one off? Narelle, I sent you an email, but the short answer is yes, I can get you one, if you can pick it up in Houston. They are too big to ship Fedex. I would still love to get one of those big grey mirrors. But I live in Orlando Florida. I coudn`t go to Houston to pick one up. Is there any way they could ship it to me other than Fedex? I am ready to buy one now. 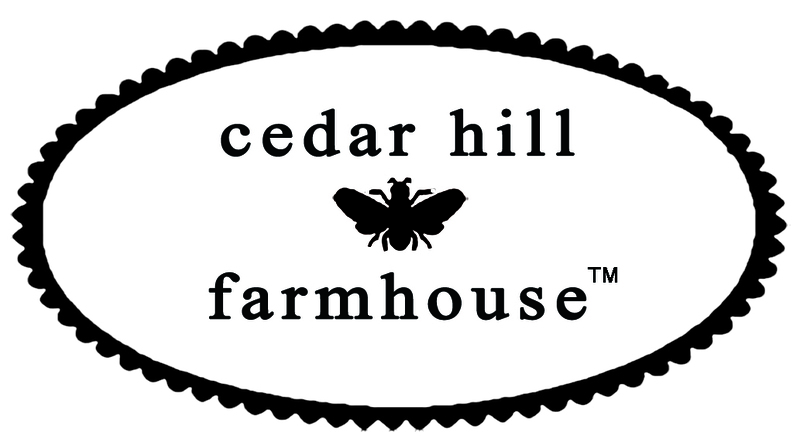 Just love love love your Cedar Hill Farmhouse Site! Narelle, I don’t have my online shop any more, so my account with the wholesaler was closed. I don’t have a way to order one any more. I would suggest you try some local shops and see if they can order one for you. I don’t blame you, it’s a lovely mirror!! Thanks for this post. I am now inspired to do my bedroom. 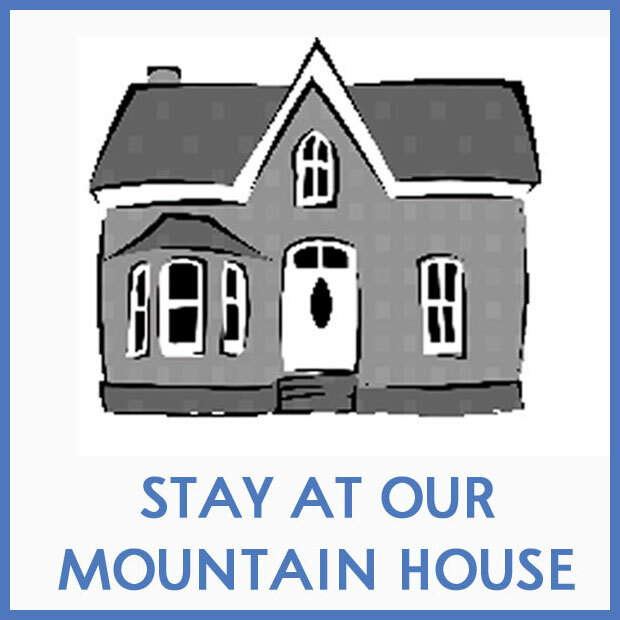 Tell me, how often are you getting to enjoy your mountain house? We have one too and it gets harder and harder to get away but when we do we love that cool crisp air. Hope you are enjoying your new place too. Debbie, we have hardly been there. BUT, plan to live there in the summers in retirement which is getting closer every day. So we hope to be spending a lot of time there soon. I have a painting question. I have some mirrors similar to yours that I want to paint. I’ve done a lot of furniture in chalk paint but I can’t figure out how to paint things with intricate details (like the flowers) without the paint building up and looking horrible in those spots. Suggestions? Try using less paint on your brush. Not sure why you are getting a build up. Thank you for the inspiration to be real. I am decluttering and organizing over the next few weeks. I was having a hard time with the thought of putting “real” before pics up on my blog. I think I can do it now…. Your daughters room is really pretty. I love that you share the actuality of everyday living! Great post! 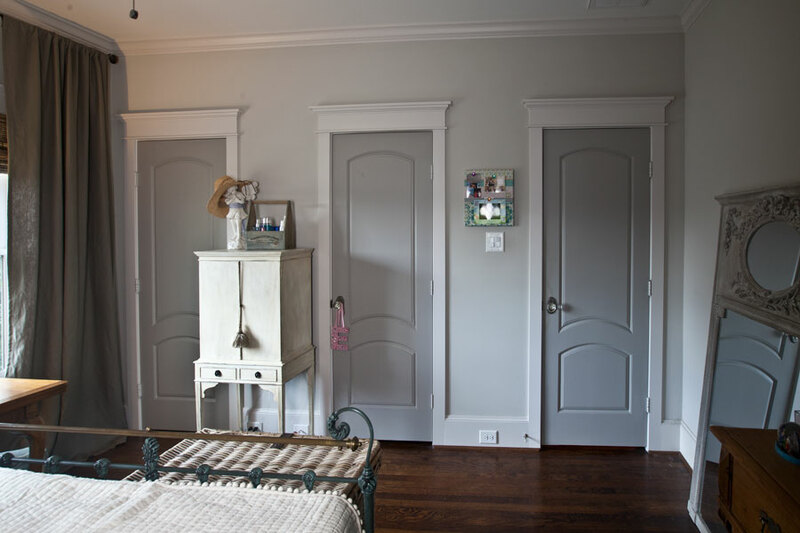 Could you please share the paint color on the walls, the trim, and those dreamy doors!? My husband even though an Old Marine, and neat about a lot of things so its a process to stop clutter of paper mostly, but we are working on it!! !Love what you and your daughter did…Last year when our living room/hall and Kitchen (we have an open concept house), I picked a very very light green called Forest Light and love it…I went with getting rid of a lot of the stuff (although I still liked it)and only put 3 large pieces back up there….love it and got rid of the long draperies….we keep working on decluttering every day!!!!! Me what brand and color paint you used for your trim and doors? It’s gorgeous! An attic room that is a bedroom has been my target recently. A early teen lives in this room. It also accumulated everything unwanted from the rest of the house. When I started I felt like I needed a construction dumpster outside! It took constant work but after having her decide if she is a teen or little girl, alot of it could be put away. Two truck loads went to Goodwill and the rest goes to anyone that wants it in my family. Finally it’s done and like you Anita, I and my girl loves the space we created. Finished redo on the horizon.Thanks for inspiration. Thanks for sharing the reality of a messy room. My son, now 43, was a big time slob. Whenever he went to Boy Scout weekends, I would dump, dump, dump. He used his room as a trash can. Now that he has his own place, he is a neat freak! I have trouble with keeping my closets organized. Thanks for all the tips. I love to declutter. I think the biggest challenge to cleaning out and organizing is having a place to put things. I found that by buying storage bins and other organizers and not exceeding their capacities helps keep me in control and not keep buying more. If you don’t have room to store it, don’t buy it! I like things neat and organized too. 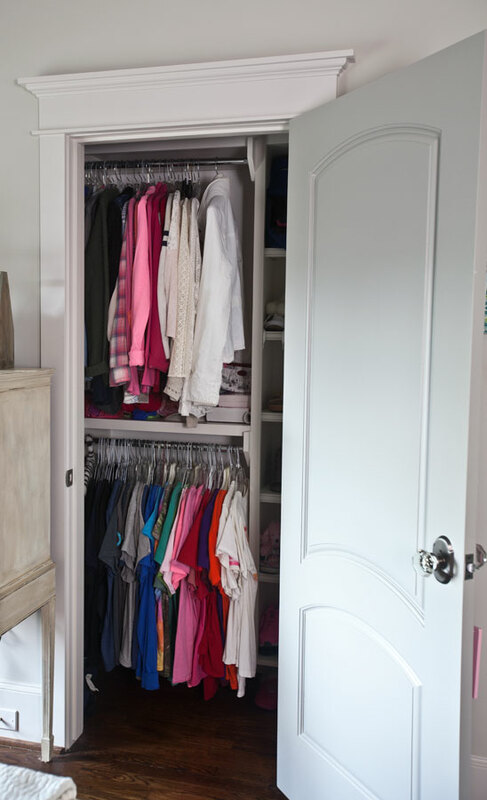 I bet your daughter will find it easier to keep things that way now that everything has a designated spot. Great topic! I too like things neat and organized. Like you, I organize my tops by sleeveless, short sleeves, long sleeves, sweaters, jackets, and then by color within each group. The other clothing is just organized by dresses, skirts, etc. It helps me to really see what I own. You are the first person I know that does the same. Thanks for the helpful tips. I always enjoy reading your articles and I love your style! Good to know I’m not the only one who does that, ha!